Spring has sprung around here, and with it – New Patagonia! From color changes and style changes to new products, our favorite base layer (and more!) company has been hard at work. The most significant change award this season goes to the Capilene 1 base layer. For those not familiar with the Patagonia Capilene line, it ranges from a Capilene 1 to 4. The Capilene 1 is the lightest of the line, designed for high activity in hot conditions. With exertion and/or temperatures dropping, the line progresses in numbered increments to what will make you warmest: the Cap4. Made with Polartec fleece, its main focus is to give you the highest warmth with the least amount of weight. Designed for any condition you face, Patagnia’s Capilene line has a piece for you. Patagonia’s famous line of base layers underwent a major change over the past six months. In the fall, the 2, 3, and 4 changed – adding increased warmth, moisture management, stretch, softness, and durability. This Spring, they finished with both the Men’s Capilene 1 and Women’s Capilene 1, making it lighter, softer, more breathable, faster drying, and stretchier. Plus, they added a new silkweight stretch shirt that has 50+ UPF (much improved from the traditional Cap1 with UPF 15) and also comes in a men’s and women’s version. The Capilene 1 shirt and pants are made of 3.4oz polyester with Gladiodor control and 15 UPF sun protection. The Gladiodor odor control is a natural odor control that doesn’t rely on metals or antimicrobials like other odor control treatments. With a new fabric make-up and a new stretchy shirt being added, the Cap1 feels silkier and lighter than ever before. All of the Capilene are now made with more than 50% recycled polyester. Capilene 1 is completely made of recycled material, and it is recyclable. Since spring 2007, Capilene has been made of recycled materials. All new shirts and pants are recyclable through their Common Threads Recycling Program, an initiative to make old clothes into new and to keep them out of a landfill. With help from their loyal customers, they set the goal of having all clothes be recyclable. After taking 6 years to work it out – beginning in fall of 2011, every piece of Patagonia (not just Capilene) clothing will be recyclable. In addition to making their clothing recyclable, Patagonia tracks and measures the impact of each type of clothing through their Footprint Chronicles. You can now see the footprint of any article of clothing. For instance, the Capilene 1 traveled 7,320 miles to get to their Reno distribution center, required 3.7lbs of CO2 emissions, generated 1.9oz of waste, and consumed 4.6kWh of energy. We’re really into the fact Patagonia has always promoted an environmentally aware production process, and that’s one of the many reasons we like their products. New board shorts for men and women. First, for the men, a new version of the popular Wavefarer Board Shorts. The new Stretch Wavefarers are well, stretchier. 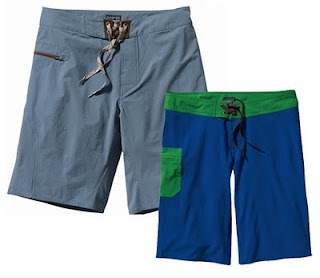 With a lighter fabric, these board shorts are hardwearing to stand up against your boat ride, beach trip, or any kind of water fun. A no-frills, all-business board short, the Wavefarer is a great alternative to bulky sailing shorts. For the ladies, we have the Girona Board Short that has a little retro look. With a longer cut and low rise design, these shorts will be your go-to short for the summer. Made of a polyester/spandex blend, they stretch while you move while being comfortable and practical for any kind of summer activity. We’ve added a few new middle layers this spring, too. For the women, we’ve picked up a new full-zip Nano Puff to compliment the pullover we’ve had before – Yay! We love Nano Puffs! A popular stand alone layer or middle layer when it gets cold, the Nano Puff is a staff favorite. It comes in a variety of nice colors, from natural to ultramarine to help get past your winter blues. 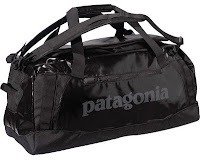 Need a place to store all of your new Patagonia? The Black Hole Duffel is water-resistant with a Durable Water Repellent (DWR) finish to protect your gear. Depending on how well you pack, there are two options, 60L or 90L, and for all of the organizers out there, two mesh pockets on the inside to make sure you know where everything is. With two convenient ways to carry, either by handle or padded, adjustable shoulder straps, this duffel will be your favorite gear bag. Note: We also added many new colors to our existing offerings. From Ultramarine to Bali Blue, the springtime colors are vibrant and fun. So as we welcome the new warmer temperatures, we’re happy Patagonia has our back. Happy Spring, Everyone!